This is a feminine and warm bouquet with dominating rose and violet notes. 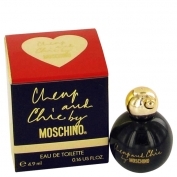 Top notes include the freshness of water flowers and Citrus. Heart note is composed of the sumptuous bouquet made of rose, jasmine, freesia, violet, and peony. The base includes the notes of cedar, musk, vanilla, orchid and grey amber. Cheap & Chic was launched in 1995.